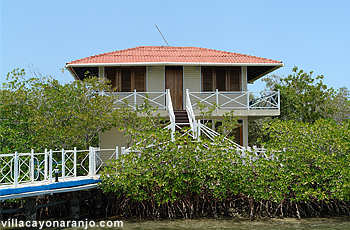 The first floor of Bungalow Birancito in Hotel Villa Cayo Naranjo consists of single bedroom, living room, kitchen, bathroom; second floor – double bedroom living room, kitchen and bathroom. The house if fully air-conditioned and has cable TV. Any guests staying at this villa can swim with the dolphins as often as they like.